The Murer House & Learning Center - Help us preserve this historical landmark by joining the Murer House Foundation HERE. We plan to organize public tours and more events this year. Can you help by becoming a docent or help out with events? From Sacramento, take Hwy. 50 east, exit at Folsom Blvd. Exit at Folsom Auto Mall, turn left on Folsom Blvd., turn left on Natoma Street, take second right at Sutter Street, take first right on Fong Street, parking lot is straight ahead. 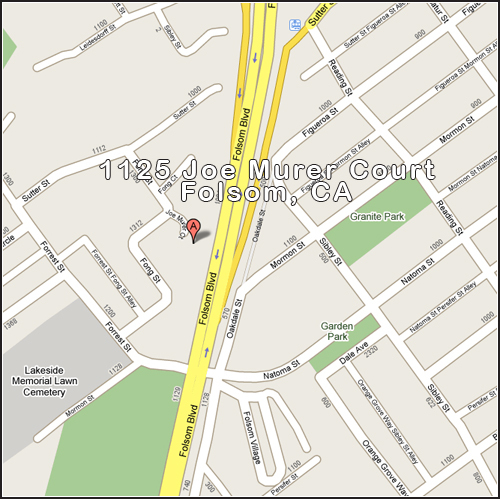 From El Dorado Hills, take Green Valley Road into Folsom and veer right on Natoma Street. Go straight on Natoma Street, cross Folsom Blvd., take second right at Sutter Street, take first right on Fong Street, parking lot is straight ahead. From Roseville/Orangevale, take Auburn-Folsom Road into Folsom, after crossing Lake Natoma Crossing bridge, turn right at first stoplight "Forrest Stree," take second right at Sutter Street, take first right on Fong Street, parking lot is straight ahead.